← How did the Milwaukee Art Institute acquire Edmund Tarbell’s “Three Sisters – A Study in June Sunlight”, 1890? Rubens Peale (American, 1784–1865), Apple and Two Pears on a Pewter Plate, 1861. Milwaukee Art Museum, Purchase, Layton Art Collection. Photo by John R. Glembin. In the American Collections of the Milwaukee Art Museum is an example of the long-standing artistic tradition, the still life painting. Apple and Two Pears on a Pewter Plate (1861) by Rubens Peale, speaks both to the history of the still life genre and the Peale family’s American artistic dynasty. Historical origins of the still life trace back to antiquity, but it was not until the Renaissance that still life painting rose and flourished as a distinct tradition, when painters throughout Europe explored the art of painting a carefully arranged assemblage of objects. In the 17th century, Holland was especially prolific. Dutch painters, influenced by the naturalism of the Northern Renaissance, produced a large corpus of still life paintings categorized into the following types: the flower-piece, the fruit-piece, the breakfast-piece, the Vanitas, the fish-piece, the banquet-piece, and the game-piece. You can see several examples of 17th-century Dutch still life paintings on view in the Museum’s Gallery #5. Also, you’ll find this (gruesome!?) Italian Still Life with Fish on view in Gallery #6. Gaetano Cusati (Italian, d. ca. 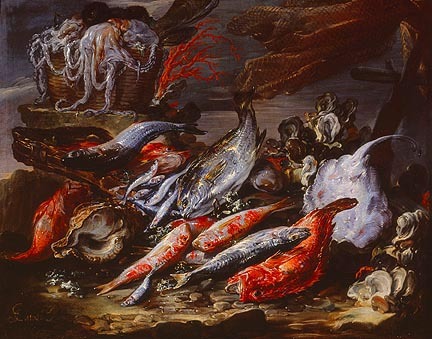 1720), Still Life with Fish, ca. 1710. Milwaukee Art Museum, Gift of Dr. and Mrs. Alfred Bader. Photo by John R. Glembin. These painters were not only conscious of specific categories, but symbolism within those categories. A banquet-piece, full of bounty and extravagance, may reveal wilting flowers, rotting fruit, and feasting flies. The Vanitas type depicts more obvious symbols, often a skull or an hourglass. In still life, the concept of memento mori, a reminder of mortality, prevails as an extension of the biblical and moral works of Medieval Europe. Such symbols represent the temporary state of the material world and can function as a call to faith and the reward of eternal life. Apple and Two Pears on a Pewter Plate by Rubens Peale is an American representation of this Dutch tradition. 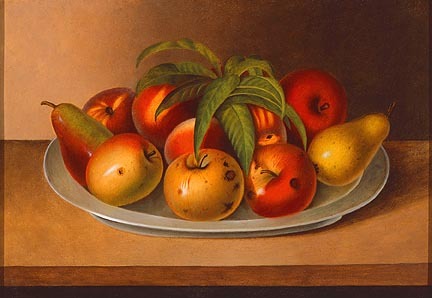 Peale’s fruit-piece displays a collection of red and gold apples flanked on either side by two pears and garnished with a sprig of green leaves. The pear to the left is still green, firm and unripe. On the right the pear appears yellow and ripened. The apples in the foreground are bruised and discolored, showing signs of decay. Reminiscent of 17th-century still life paintings, these symbols chronicle the passing of time and serve as a memento mori. Rubens Peale would have been familiar with this earlier tradition and symbolism. In 1784 he was born into America’s first artistic dynasty. As the fourth son of prominent portraitist and naturalist Charles Wilson Peale, Rubens was exposed to art from a young age. Unlike his siblings, however, Rubens was not trained for a career in art. He suffered from poor eyesight and trained instead as a naturalist. His career was spent as a museum-man. Rubens managed first his father’s museum in Philadelphia, followed by his brother Rembrandt’s museum in Baltimore, and finally his own in New York before financial difficulties forced him to retire to Pennsylvania. It was in his retirement, at the age of 71, that Rubens finally took up painting. He often copied works of his relatives and received lessons. Apple and Two Pears on a Pewter Plate was produced just four years before his death in 1865. 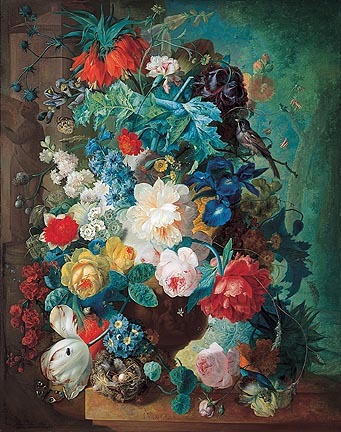 At the Milwaukee Art Museum study the tradition of still life further with Dutch painter Jan van Os’ Flowers in Terra-cotta Vase (1780), an opulent Rococo arrangement of over twenty types of flowers. You’ll find this floral bounty on view in the Museum’s gallery #8. Jan van Os (Dutch, 1744–1808), Flowers in Terra-cotta Vase, after 1780. Milwaukee Art Museum, Layton Art Collection, Gift of Frederick Layton. Photo by Larry Sanders. 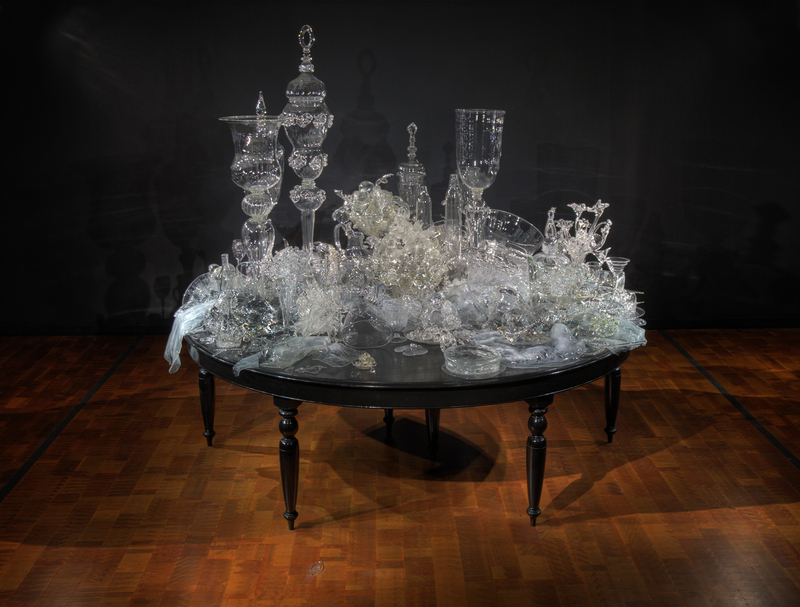 For a contemporary commentary on still life see Wisconsin artist Beth Lipman’s 2007 work, Laid Table (Still Life with Metal Pitcher), a composition of approximately 500 handmade glass pieces. Laid Table is on view in the Museum’s Studio Craft gallery on the Main Level. Beth Lipman (American, b. 1971), Laid Table (Still Life with Metal Pitcher), 2007. Milwaukee Art Museum, Milwaukee Art Museum, Purchase, Jill and Jack Pelisek Endowment, Jack Pelisek Funds, and various donors by exchange. Photo by John R. Glembin. 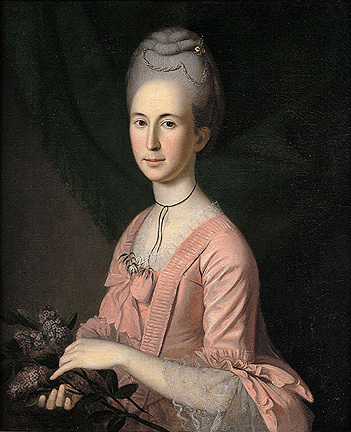 Or dive into the history of the Peale family and view patriarch Charles Wilson Peale’s 1774-74 portrait, Elizabeth McClure or Mrs. Mordecai Gist (Cecil Carnan) on view in the Lower Level Collection Galleries. Charles Willson Peale (American, 1741–1827), Elizabeth McClure or Mrs. Mordecai Gist (Cecil Carnan), 1774-75. Milwaukee Art Museum, Layton Art Collection. Photo by John Nienhuis and Dedra Wells. This entry was posted in Art, Curatorial and tagged 19th Century Art, American Art, Beth Lipman, Charles Wilson Peale, Collection, From the Collection, Gaetano Cusati, Jan van Os, Rubens Peale, still life painting. Bookmark the permalink.